I didn’t know this about Fresno… that it was this relentless expanse of urban sprawl, reminiscent of Phoenix or Scottsdale or Tucson or Mesa, Arizona, all laid out on a giant grid, one mall after another, after another…. Maybe all this development has happened relatively recently. Maybe Fresno was once a central valley ag town with a core area and older neighborhoods surrounded by fields, orchards, rotating crops, pastures… but isn’t any longer. Maybe it still is and we only saw the new stuff. But wow. There are huge (like eight-lanes-across huge) boulevards that extend for miles and miles across town in all directions. They seem built to accommodate traffic that is not yet there. There are elaborate traffic signals at the intersections, again designed to manage traffic not yet there. Off the main drags are subdivisions and housing developments with names like Harrington Estates (made that up), each neatly contained behind some wall or landscaped barrier, the entrances of which are overly stately and/or decorated with some combination of fountain, gate, line of flags, flower-filled terrace, or all of the above. There are strip malls and shopping centers everywhere and they all seem similarly adorned with palm trees, corner water features, stamped concrete traffic circles and very organized, manicured landscaping. The malls all have the usual suspects: Starbucks, Pet Smart, Five Guys, Subway, Office Max or whatever. If we wanted, say, a Jamba Juice, we’d enter it into the Garmin and up would pop a dozen options, none very far from where we were, and off we’d go, zig-zagging through the grid to the nearest one. There are ready cuisine choices of any type. All have their own distinct and recognizable design and layout, menus, seating options. It’s just weird. And yet all kind of normalized. So, Jim and I are sitting at a Starbucks, in the middle of one of these new, clean, modern shopping centers, eating from pre-packaged meal boxes that we’ve come to know will be available at any Starbucks we walk into, reviewing our options for lunch later that afternoon. The boys might want an In ‘N Out, or a Chipotle, or a Rubios, and whatever the choice, they know exactly what to expect, they know their personal orders. And it suddenly struck me, that it felt like something out of the Jetsons. It all felt uber mechanized and modern. GPS’ing around at 90 degree angles felt robotic. All we needed were little flying cars. I couldn’t help but wonder what our grandparents would think if they were suddenly brought back for a little glimpse of the future. … future defined as only a couple-three decades after their passing. Could they have imagined this is what would become of life in modern cities? 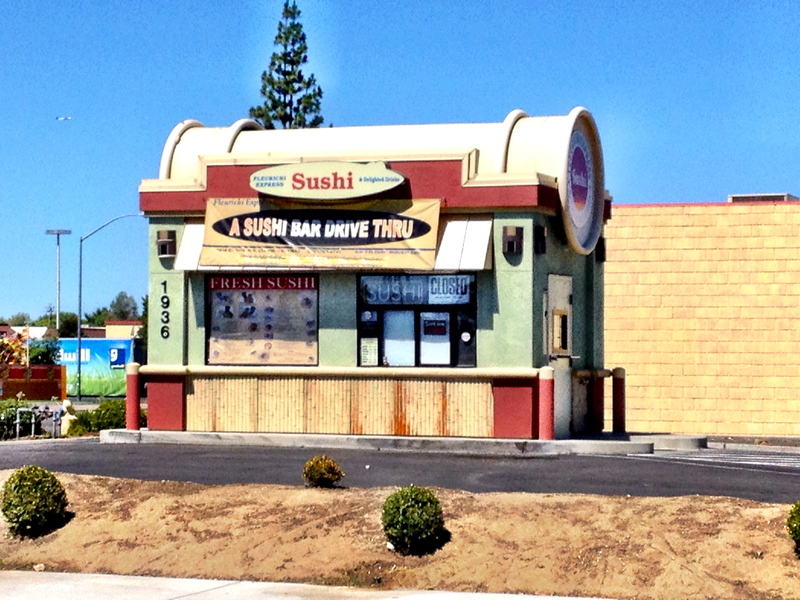 The photo is of a drive-in sushi place.